In many countries, beautiful platters of food are safely served at room temperature. The colorful dishes can be prepared up to two days prior to serving—refrigerated, marinated, and ready for arrangement. Grill a wide selection of seasonal veggies—Whether outdoors or on a stovetop using a grillpan, simply toss veggies—such as beets, arugula, or green beans—with a bit of olive oil, salt, pepper, and dried Italian herbs before frying or putting on the barbeque. For a Latin flair, toss with ground cumin seed, oregano, garlic, and bottled sour orange juice. Enhance bottled or canned roasted peppers, artichoke hearts, hearts of palm, or other vegetable—Drain and add balsamic vinegar, olive oil, and freshly minced herbs to marinate. Grill or roast chicken—Marinate boneless chicken breasts with the above mixture, cook, slice, and put them on a platter. Garnish with capers, lemon, and sprigs of fresh herbs. Roast a salmon—Drizzle olive oil, lemon, herbs, and a light dusting of bread crumbs over a whole small side of salmon (about 2 pounds [902 grams]) and place in the oven at 400°F (200°C). Serve it whole on a platter. Cook up some pasta—Make an al dente batch of penne, tortellini, orecchiette (little ears), rigatoni, or other favorite. Immediately drain, rinse, and toss with a bit of oil before storing in the refrigerator. The day of your party, toss with your favorite salad dressing and some fresh spinach and basil leaves. Make souffléd tomatoes, zucchini, and eggplant—How? Hollow out cavities in the vegetables, fill with a mixture of 1 cup (108 grams) of bread crumbs, 1/2 cup (40 grams) of shredded cheese such as Parmesan, mozzarella, provolone, or asiago cheese, 2 beaten egg whites, and 1 tablespoon (8 grams) of dried Italian herbs. Fresh chopped basil is another fine addition. Stuff the hollowed vegetables and bake in a pan in a preheated oven at 350°F (180°C) for 20 minutes until vegetables are tender and filling is puffy. This is the only dish that needs to be made the day of your party. Take time to make your presentation the final touch. A sprinkle of extra virgin olive oil, lemon juice, or chopped fresh herbs is often all that is needed to finish these dishes off and delight your guests. 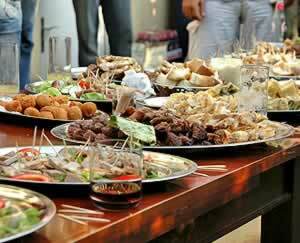 Take the prepared foods out of the refrigerator 1 hour before laying out your buffet table. Arrange them on colorful ceramic dishes of various shapes, with an eye to color contrast in your placement. Supplement your buffet with fresh rustic loaves of bread, a selection of cheeses, bottles of extra virgin olive oil and balsamic vinegar with small platters for dipping, and perhaps a pitcher of homemade sangria. Use warm earth-tone cloths and placemats for a global feel. Always have a fresh floral arrangement to complement your table. Place forks and napkins at the end of your buffet so that your guests’ hands are free for serving. Chef Steve Petusevsky is a syndicated columnist and cookbook author who frequently becomes a guest at his own party by following his own advice.